I loved that when Joel introduced "Reality Show Clip Time," Michael said, "Define reality," in a spooky Lost sort of way. And I do agree with Michael Emerson that watching clips of the Kardashians makes me want to go move to an island somewhere. So, all in all, just brilliant. This episode of The Soup is further proof that Michael Emerson is made of win. He's one of the best Soup guest stars I've ever seen, and I think the show runners agreed, because that's the longest time any guest I've seen has been on the show. Good on them for recognizing comedic talent when they see it. You can watch The Soup on E!, Friday nights at 10/9c. 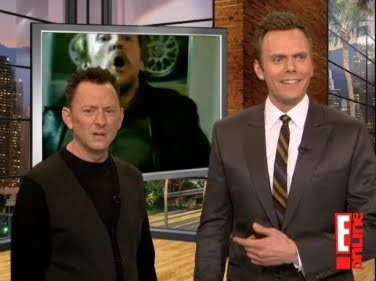 PHOTO: Michael Emerson, who plays villian Ben Linus on Lost, visits Joel McHale on the set of E! clip show The Soup, c2010 E!Online.